Once upon a time, Lily and Jasper Winter had an uncle named Ebb. He liked to tell tales of a place called the Moon Realm, where nine moons swirled around one another, each inhabited by strange and wondrous beings: magical lunamancers; undersea merfolk; wise birds; winged dragons; and Lily’s favorite, the heroic, leonine Rinn: =^..^=. Uncle Ebb had quite the imagination. Now, nine years after the tales began, he’s missing. 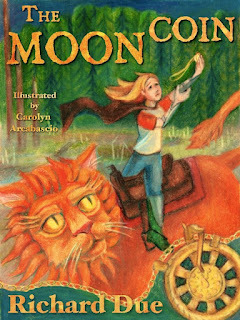 Soon, so is Lily, transported to the Moon Realm by a mysterious coin. But this Moon Realm is different. Here, a villain named Wrengfoul and his evil minions are attacking the other moons, stripping away what little magic remains. Had Uncle Ebb just been spinning tales of how he wanted things to be? Where did the truth begin and the fantasy end? And how will Lily ever get home? The Moon Coin was a great read from start to finish. Richard Due’s writing really makes the reader feel as though they are there with Lily as she ventures through the Moon Realm. When I first heard of this book, I was immediately intrigued by both the artwork and the description. I love fantasy, and especially fantasy that crosses over with Earth. As I read, I was constantly reminded of Narnia, especially when I came to the part with the giant cats, called Rinn, I couldn’t help but think of Aslan. Mr. Due’s world building is phenomenal. The idea of the Moon Realm, a place where nine moons orbit each other (though the natives of each moon insist that their world is a planet and the other moons orbit around it) and get close enough to touch, was so completely original, I loved reading about it. All of the landscapes were so elaborately described, it is almost hard to believe they are not real places. I really do not have any complaints about this book at all, except for maybe the fact that I have to wait to read the next installment. 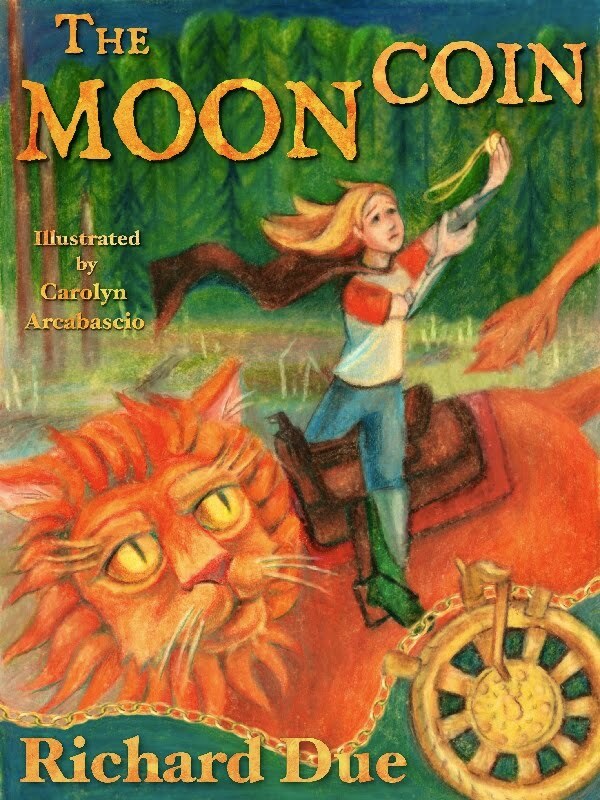 I would recommend The Moon Coin to readers of all ages. I believe it will beloved by children, but it is also extremely entertaining to older audiences as well. Any fan of fantasy should get their hands on a copy of this book. The Moon Coin sounds intriguing. CURSED: WICKEDLY FUN STORIES available now!